102.7 CHOP FM is an online based radio station broadcast from Newmarket, Ontario, Canada, playing College. This FM is a student-operated radio station serving Pickering College and the wider Newmarket community and it is owned by Pickering College. Here provide in-depth training for students and teachers in all aspects of radio broadcasting skills and regulations. The station would offer a wide range of music, including rock, pop, dance, acoustic, world beat, jazz, blues and international music. 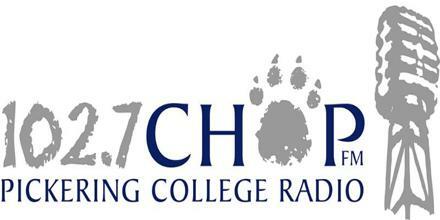 To get more information just visit 102.7 CHOP FM official website: www.pickeringcollege.on.ca. The radio station giving students the opportunity to become on-air hosts, producers, editors and interviewers, as they help manage the station’s day-to-day operations. The students enrolled in its Communications Technology course would produce programming under the guidance of their teachers. CHOP-FM is a high school radio station that operates at 102.7 FM in Newmarket, Ontario, Canada. Owned by Pickering College, the station began broadcasting on September 28, 2007, after it was given approval by the Canadian Radio-television and Telecommunications Commission (CRTC) on February 1, 2007. The station was modelled after another high school radio station in the province called CKVI-FM located in Kingston, Ontario. Broadcasting from Pickering College campus, this fully functioning radio station and provides a range of community-based programming including a live morning show, sports updates, and feature programs; all produced by Pickering students. Moreover, the music offered by the station would include rock, pop, acoustic Jazz, dance, blues and other Canadian and international music. Social contact: Facebook, Twiter, Website. Liveonlineradio.net has 102.7 CHOP FM Radio in its listings. Just click and enjoy. 102.7 CHOP FM – www.liveonlineradio.net/canada/102-7-chop-fm.